The physical structure of a plant is referred to as its “morphology”. It includes the nature of its flowers and fruit, as well as its growth form and leaf structure. The African Violet is in a number of ways typical of other members of the Gesneriaceae. The floral structure is a cyme, and flowers are a tube fused at the base with five rounded lobes. The plant and leaf structure is somewhat varied, although primarily rosulate or creeping/caulescent. As in most Gesneriads, hairs are present on both flowers and foliage. 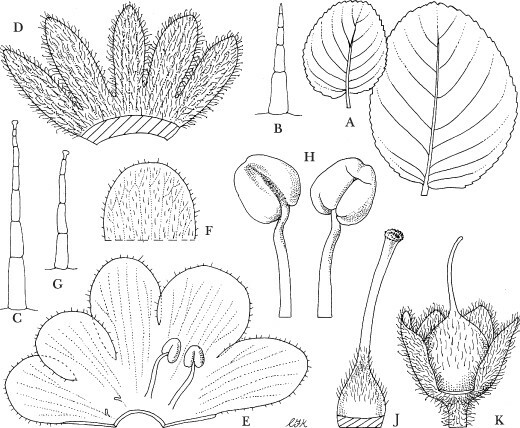 Drawing of parts of Streptocarpus ulugurensis, from Haston et al (2009): A, leaf outlines, ×1/3; B, hair from upper surface of leaf, × 40; C, hair from petiole, × 40; D, calyx, exterior, × 4; E, corolla, interior, × 2; F, corolla lobe, exterior, × 2; G, hair from corolla, × 120; H, stamen, 2 views, × 6; J, gynoecium, × 4; K, developing capsule, × 4. Drawn by Christabel King from Haston102, cultivated at The Royal Botanic Garden, Edinburgh.